Badger Classic Lip Balm sticks contain Organic Extra Virgin Olive Oil and Beeswax, as well as Organic Aloe, Seabuckthorn and Rosehip extracts. These ingredients moisturize and protect, making these lip balms excellent for facing the elements. They have a light texture, and come in unique flavors made from the real stuff - steam-distilled essential oils, no artificial colors, flavors or sweeteners. 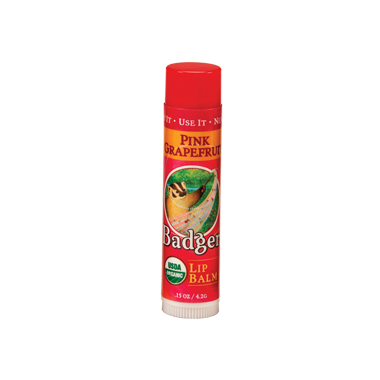 Badger Organic Lip Balms are smooth and glossy - and they contain a bounty of antioxidants. They moisturize your lips and make them feel great! One of my favourite lip balms! So moisturizing and great flavour without huge shine. It makes a great base under lipstick or on its own. Goes on smoothly. Nice mild flavour. As with the orange flavour, this balm isn't strong or over powering, but if you like a big, grapefruit experience, it may disappoint. However, the quality is there. Nice and rich. Feels good on the lips. I would buy this again, but not the orange flavour, as the mix of orange and other flavours is a bit off-putting. Love this stuff! It's so moisturizing and the grapefruit flavour is so tingly. Just yummy!